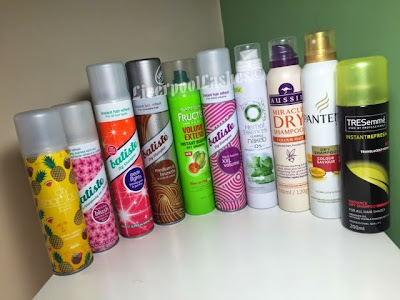 I feel like when it comes to dry shampoo I have virtually try most of the well-known brands to the point where I may even cost myself as a connoisseur. I was talking to my friend about the different dry shampoos so I figured it might be helpful for me to pull my thoughts together on one blog post. I think it is best for me to rank them in order of which I like the best. In a nutshell I find that most brands slightly clean the hair but don't really improve the overall look or feel to it. I think that the best shampoo is by TRESemme. This shampoo gives me both the clean look and feel to my head with a pleasant fragrance. It also doesn't give quite the same white cast got my second favorite gives. I would buy the shampoo every time if the price was the same as my second favourite both of course if it is on special offer I would definitely pick up a few bottles of it. Next up is Batiste which is probably technically my overall winner because it does the job and it's a better price than the TRESemme dry shampoo. You can buy a coloured version if you really don't like the white cast but I find that even with my dark hair if you rub it well it's fine. On a side note however, I didn't really enjoy their XXL volume versions. It is good for giving volume but it does also leave your head feeling quite matted. Since I am going in order of my favourites, next all is surprisingly Asda's own dry shampoo. If you were on a budget then I do think that the shampoo is the closest to Batiste. I would actually say it is so close that it's hard to tell the difference but Batiste is slightly better. After that I'm afraid that most of the others pictured above fairly similar to me. They all have decent scent, they freshen the hair slightly don't really give the hat anymore life back into it. I can't really pick out the worse shampoo I literally feel like they are all on par with each other but I was disappointed to see such big brand names with not very good products.